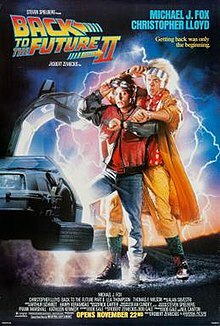 Back to the Future Part II is a 1989 American science fiction film directed by Robert Zemeckis and written by Bob Gale. It is the sequel to the 1985 film Back to the Future and the second installment in the Back to the Future trilogy. The film stars Michael J. Fox, Christopher Lloyd, Thomas F. Wilson, and Lea Thompson. The film follows Marty McFly (Fox) and his friend Dr. Emmett "Doc" Brown (Lloyd) as they travel to 2015 to prevent Marty's son from sabotaging the McFly family's future. Their arch-nemesis Biff Tannen (Wilson) steals Doc's DeLorean time machine and uses it to alter history for his benefit, forcing the duo to return to 1955 to restore the timeline. The film was produced on a $40-million budget and was filmed back to back with its sequel, Part III. Filming began in February 1989 after two years were spent building the sets and writing the scripts. Two actors from the first film, Crispin Glover and Claudia Wells, did not return. While Elisabeth Shue was recast in the role of Wells's character, Jennifer, Glover's character, George McFly, was not only minimized in the plot, but also was obscured and recreated with another actor. Glover successfully sued Zemeckis and Gale, changing how producers can deal with the departure and replacement of actors in a role. Back to the Future Part II was also a ground-breaking project for effects studio Industrial Light & Magic (ILM): In addition to digital compositing, ILM used the VistaGlide motion control camera system, which allowed an actor to portray multiple characters simultaneously on-screen without sacrificing camera movement. Back to the Future Part II was released by Universal Pictures on November 22, 1989. The film received mixed reviews from critics and grossed over $332 million worldwide, making it the third-highest-grossing film of 1989. On October 26, 1985, Dr. Emmett Brown arrives in the DeLorean time machine and persuades Marty McFly and his girlfriend, Jennifer Parker, to travel to the future with him and help their future children, with Biff Tannen witnessing their departure. They arrive on October 21, 2015, where Doc electronically knocks out Jennifer and leaves her asleep in an alley, explaining that she should not have too much knowledge of future events. He has Marty pose as his own son and lookalike Marty Jr. to refuse an offer to participate in a robbery with Biff's grandson Griff, thus saving both of Marty's children from prison. Marty switches places with Marty Jr. and refuses Griff's offer, but Griff goads Marty into a fight. Griff and his gang are arrested, saving Marty's future children. Before rejoining Doc, Marty purchases an almanac, containing the results of major sporting events from 1950 to 2000. Doc discovers it and warns Marty about attempting to profit from time travel but, before Doc can adequately dispose of it, they are interrupted by the police, who have found Jennifer incapacitated, and are taking her to her 2015 home. They pursue, as does Biff, who has overheard their conversation and picks up the discarded almanac. Jennifer wakes up in her 2015 home and hides from the McFly family. She overhears that her future self's life with Marty is not what she expected, due to his involvement in an automobile accident. She witnesses Marty being goaded by his co-worker, Douglas J. Needles, into a shady business deal, resulting in Marty's firing. Jennifer tries escaping the house but faints after she encounters her 2015 self. While Marty and Doc attend to her, Biff steals the time machine and uses it to travel to 1955 and give the almanac to his younger self to get rich betting, then returns to 2015. Marty, Doc, and an unconscious Jennifer return to 1985, unaware of Biff's actions. The 1985 they return to has altered: Biff has become wealthy and corrupt, and has changed Hill Valley into a chaotic dystopia; Marty's father, George, was killed in 1973 and Biff has forced Marty's mother, Lorraine, to marry him; and Doc has been committed to an insane asylum. Marty and Doc determine that the 2015 Biff took the time machine to change 1985, and Marty learns from the alternate 1985 Biff that he got the almanac on November 12, 1955. Biff tries killing Marty, but Marty flees and travels to 1955 with Doc, leaving Jennifer on her own front porch. Marty secretly follows the 1955 Biff, and watches him receive the almanac from his 2015 self. Marty then follows him to the high school dance, being careful to avoid interrupting the events from his previous visit. After several fruitless attempts, Marty finally gets the almanac, leaving Biff to crash into a manure truck. Marty burns the almanac, reversing Biff's changes to the timeline, as Doc hovers above in the time machine. Before Marty can join him in the time machine, the DeLorean is struck by lightning and disappears. A Western Union courier immediately arrives and delivers a very old letter to Marty; it is from Doc, who explains that he was transported back to 1885. Marty races back into town to find the 1955 Doc, who had just helped the original Marty return to 1985. Shocked by Marty's sudden reappearance, Doc faints. Gale wrote most of the first draft by himself, as Zemeckis was busy making Who Framed Roger Rabbit. At first, the film was to take place in 1967, but Zemeckis later stated that the time paradoxes of it provided a good opportunity to go back to 1955 and see the first one's events in a different light. While most of the original cast agreed to return, a major stumbling block arose when negotiating Crispin Glover's fee for reprising the role of George McFly. When it became clear that he would not be returning, the role was rewritten so that George is dead when the action takes place in the alternative version of 1985. The greatest challenge was the creation of the futuristic vision of Marty's home town in 2015. Production designer Rick Carter wanted to create a very detailed image with a different tone from the film Blade Runner, wishing to get past the smoke and chrome. Carter and his most talented men spent months plotting, planning and preparing Hill Valley's transformation into a city of the future. Visual effects art director John Bell stated they had no script to work with, only the indications that the setting would be 30 years into the future featuring "something called hoverboards". When writing the script for the film, Gale wanted to push the first one's ideas further for humorous effect. Zemeckis said he was somewhat concerned about portraying the future because of the risk of making wildly inaccurate predictions. According to Gale, they tried to make the future a nice place, "where what's wrong is due to who lives in the future as opposed to the technology" in contrast to the pessimistic, Orwellian future seen in most science fiction. To keep production costs low and take advantage of an extended break Fox had from Family Ties (which was ending its run when filming began), it was shot back-to-back with sequel Part III. It took two years to finish the set building and the writing on the script before shooting could finally begin. During the shooting, the creation of the appearance of the aged characters was a well-guarded secret, involving state-of-the-art make-up techniques. Michael J. Fox described the process as very time consuming. "It took over four hours, although it could be worse". Principal photography began on February 20, 1989. For a three-week period nearing the conclusion of the film, the crew split and, while most remained shooting Part III, a few, including writer-producer Gale, focused on finishing its predecessor. Zemeckis himself slept only a few hours per day, supervising both films, having to fly between Burbank, where it was being finished, and other locations in California for Part III. The film was considered one of the most ground-breaking projects for Industrial Light & Magic. It was one of the effects house's first forays into digital compositing, as well as the VistaGlide motion control camera system, which enabled them to shoot one of its most complex sequences, in which Fox played three separate characters (Marty Sr., Marty Jr., and Marlene), all of whom interacted with each other. Although such scenes were not new, the VistaGlide allowed, for the first time, a completely dynamic scene in which camera movement could finally be incorporated. The technique was also used in scenes where Thomas F. Wilson, Christopher Lloyd, and Elisabeth Shue's characters encounter and interact with their counterparts. It also includes a brief moment of computer-generated imagery in a holographic shark used to promote a fictional Jaws 19, which wound up unaltered from the first test done by ILM's digital department because effects supervisor Ken Ralston "liked the fact that it was all messed up." Animation supervisor Wes Takahashi, who then was the head of ILM's animation department, worked heavily on the film's time travel sequences, as he had done in the original film and in Part III. As the film neared release, sufficient footage of Part III had been shot to allow a trailer to be assembled. It was added at the conclusion of Part II, before the closing credits, as a reassurance to moviegoers that there was more to follow. Crispin Glover was asked to reprise the role of George McFly. He expressed interest, but could not come to an agreement with the producers regarding his salary. He stated in a 1992 interview on The Howard Stern Show that the producers' highest offer was $125,000, less than half of what the other returning cast members were offered. Gale has since asserted that Glover's demands were excessive for an actor of his professional stature at that time. In an interview on the Opie and Anthony show in 2013, Glover stated that his primary reason for not doing Part II was a philosophical disagreement on the film's message; Glover felt the story rewarded the characters with financial gain, such as Marty's truck, rather than love. Claudia Wells' scene at the end of Back to the Future (top) was reshot with Elisabeth Shue for the beginning of Part II (bottom). Claudia Wells, who had played Marty McFly's girlfriend Jennifer Parker in the first film, was to reprise her role, but turned it down due to personal issues. The producers cast Elisabeth Shue instead, which involved re-shooting the closing scenes of the first film for the beginning of Part II. 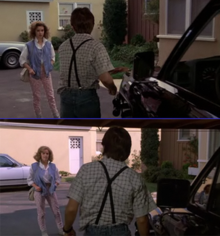 The re-shot sequence is a near shot-for-shot match with the original, with only minor differences: for example, Doc noticeably hesitates before reassuring Marty that his future self is fine – something he did not do in the first film. Marty is also wearing a watch in the second film whereas he was not in the first. Wells returned to Hollywood with a starring role in the 1996 independent film Still Waters Burn. She is one of the few cast members not to make an appearance within the bonus material on the Back to the Future Trilogy DVD set released in 2002. However, she is interviewed for the Tales from the Future documentaries in the trilogy's 25th anniversary issue on Blu-ray Disc in 2010. In 2011, she finally had the opportunity to reprise her role from the first film, 26 years after her last appearance in the series. She provided the voice of Jennifer Parker for Back to the Future: The Game by Telltale Games. Zemeckis said on the film's behind-the-scenes featurette that the hoverboards (flying skateboards) used in it were real, yet not released to the public, due to parental complaints regarding safety. Footage of "real hoverboards" was also featured in the extras of a DVD release of the trilogy. A number of people thought Zemeckis was telling the truth and requested them at toy stores. In an interview, Thomas F. Wilson said one of the most frequent questions he was asked was if they are real. According to Zemeckis, the 2015 depicted in the film was not meant to be an accurate depiction of the future. "For me, filming the future scenes of the movie were the least enjoyable of making the whole trilogy, because I don't really like films that try and predict the future. The only ones I've actually enjoyed were the ones done by Stanley Kubrick, and not even he predicted the PC when he made A Clockwork Orange. So, rather than trying to make a scientifically sound prediction that we were probably going to get wrong anyway, we figured, let's just make it funny." Despite this, the filmmakers did do some research into what scientists thought may occur in the year 2015. Bob Gale said, "We knew we weren't going to have flying cars by the year 2015, but God we had to have those in our movie." However, the film did correctly predict a number of technological and sociological changes that occurred by 2015, including: the rise of ubiquitous cameras; use of unmanned flying drones for newsgathering; widescreen flat-panel television sets mounted on walls with multiple channel viewing; video chat systems; hands-free video games; talking hologram billboards; wearable technology; tablet computers with fingerprint scanners; and head-mounted displays. Payment on personal portable devices is also depicted. Although payment by thumbprint is not widely used, fingerprint scanning is in use as security at places such as airports and schools, and electronic payment with fingerprint scanning as a security feature is deployed for Apple Pay. Cars and other vehicles have been able to be run using fuel generated from food wastes, though not through a fusion reactor as suggested in the film. The popularity of 3-D film in the 2010s was also somewhat accurately predicted, although overlaid polarized imagery remains the standard format (as it has been since the 1950s, since updated in modern times to digital) and holography is still not in use for major films. The film shows Marty putting on Nike "Air Mag" tennis shoes with automatic shoelaces. Nike released a version of their Hyperdunk Supreme shoes, which appear similar to Marty's, in July 2008. Fans dubbed them the Air McFly. In April 2009, they filed the patent for self-lacing shoes, and their design bears a resemblance to those worn by Marty in the film. In 2010, a fan named Blake Bevin created shoes that tie themselves. Though Nike had made a very limited quantity of Air Mags in the same style as the movie, they stated in September 2011 that their consumer-line MAG line of shoes would not feature the self-lacing feature shown in it. Tinker Hatfield, one of the shoe's designers, indicated in 2014 that they would introduce shoes with power-lacing technology the following year, 2015. In March 2016, Nike unveiled the HyperAdapt 1.0 shoe, which is a consumer-market model of the Air Mag and features the same self-lacing technology they used for the commemorative Air Mags, and were put on sale in limited quantities in late 2016. The concept of the hoverboard—a skateboard that can float off the ground—has been explored by various groups since the release of the film. Attempts similar to hoverboats, which blast air at the ground, have been demonstrated, with a 2015 record distance of 275 meters. A different type is the MagBoard, developed by researchers at the Paris Diderot University. It uses a large superconductor plate on the bottom cooled with liquid nitrogen as to achieve the Meissner effect and allow it to float over a special track; it was shown capable of carrying the weight of a human in its practical demonstration. However, the requirement to run the superconductor at higher, more ambient temperatures prevents this from becoming practical. In March 2014, a company named HUVr Tech purportedly demonstrated a working hoverboard along with several celebrities including Lloyd, though this shortly was revealed as a hoax created by the website Funny or Die. Self-balancing 'hoverboards' became popular in 2015 even though they do not hover above the ground. In the 2015 scene, the film imagines the Chicago Cubs winning the 2015 World Series against the fictional Miami-based Gators, referencing the Cubs' longstanding failure to win a championship. In the actual 2015 season, the Cubs qualified for the postseason, their first postseason appearance since 2008, but the Cubs lost the National League Championship Series (not the World Series) to the New York Mets on October 21, 2015, which coincidentally was the same day as "Back to the Future Day," the day Marty McFly arrived in 2015 in the film. Despite losing in 2015, one year later the Cubs did win the 2016 World Series against the Cleveland Indians; the official Twitter feed for the Back to the Future franchise tweeted out that Marty & Doc's time-traveling caused "a rift in the space-time continuum" that led to the 1994 strike (and subsequent cancellation of the 1994 World Series), thus delaying the accurate prediction by a year. In the real 2015 World Series, the Kansas City Royals defeated the Mets to win their first World Series championship since 1985, the same year from which Marty and Doc time traveled in the film. As for the fictional Miami Gators, when the film was made Florida did not yet have a Major League Baseball team, but the state has since gained two franchises: the Florida Marlins (now the Miami Marlins) in 1993 and the Tampa Bay Devil Rays (now the Tampa Bay Rays) in 1998. Neither qualified for the postseason in 2015. The film was released to theaters in North America on Wednesday, November 22, 1989, the day before Thanksgiving. It grossed a total of $27.8 million over Friday to Sunday, and $43 million across the five-day holiday opening, breaking the previous Thanksgiving record set by Rocky IV in 1985. On the following weekend, it had a drop of 56 percent, earning $12.1 million, but remained at #1. Its total gross was $118.5 million in the United States and $213 million overseas, for a total of $331 million worldwide, ranking as 1989's sixth-most successful film domestically and the third-most worldwide—behind Indiana Jones and the Last Crusade and Batman. However, this was still short of the first film's gross. Part III, which Universal released only six months later, experienced a similar drop. As of September 2018[update], the film received a 64% approval rating on Rotten Tomatoes, based on 59 reviews with an average rating of 6.18/10, with the critical consensus reading, "Back to the Future II is far more uneven than its predecessor, but its madcap highs outweigh the occasionally cluttered machinations of an overstuffed plot". The film has a score of 57 out of 100 on Metacritic, based on 17 critics, indicating "mixed or average reviews". Roger Ebert of the Chicago Sun-Times gave the film three out of four stars. Ebert criticized it for lacking the "genuine power of the original," but praised it for its slapstick humor and the hoverboard in its chase sequence. Janet Maslin of The New York Times wrote that the film is "ready for bigger and better things." Maslin later said that it "manages to be giddily and merrily mind-boggling, rather than confusing." Tom Tunney of Empire magazine wrote that the film was well-directed, "high-energy escapism", and called it "solidly entertaining", though noting it as being inferior to the other two films in the franchise. Jonathan Rosenbaum of the Chicago Reader gave the film a negative review, criticizing Zemeckis and Gale for turning the characters into "strident geeks" and for making the "frenetic action strictly formulaic." He believed that it contained "rampant misogyny," because the character of Jennifer Parker "is knocked unconscious early on so she won't interfere with the little-boy games." He cited, as well, Michael J. Fox dressing in drag. Variety said, "[Director Robert] Zemeckis' fascination with having characters interact at different ages of their lives hurts it visually, and strains credibility past the breaking point, by forcing him to rely on some very cheesy makeup designs." The film won the Saturn Award for Best Special Effects (for Ken Ralston, the special effects supervisor), the BAFTA Award for Best Special Visual Effects (Ken Ralston, Michael Lantieri, John Bell and Steve Gawley), an Internet-voted 2003 AOL Movies DVD Premiere Award for the trilogy DVDs, a Golden Screen Award, a Young Artist Award, and the Blimp Awards for Favorite Movie Actor (Michael J. Fox), and Favorite Movie Actress (Lea Thompson) at the 1990 Kids' Choice Awards. It was nominated in 1990 for an Academy Award for Best Visual Effects (John Bell, Steve Gawley, Michael Lantieri and Ken Ralston). The film was released on VHS and LaserDisc on May 22, 1990, three days before the theatrical release of Part III. It was due to be the first release under the MCA-Universal Home Video banner. Universal reissued it on VHS, LaserDisc, and compact disc in 1991, 1995, and 1998. On December 17, 2002, Universal released it on DVD in a boxed trilogy set, although widescreen framing problems led to a product recall. The trilogy was released on Blu-ray Disc in October 2010. Universal re-released the trilogy alongside new features on DVD and Blu-ray on October 21, 2015, coinciding with Back to the Future Day. The new set included a featurette called "Doc Brown Saves the World", where Lloyd, reprising his role as Doc Brown, explains the reasons for the differences between the future of 2015 as depicted in Back to the Future Part II and in real life. The soundtrack was released by MCA Records on November 22, 1989. AllMusic rated it four-and-a-half stars out of five. Unlike the previous soundtrack, it contains only a musical score by composer Alan Silvestri. None of the vocal songs featured throughout the film are featured. On October 12, 2015, Intrada Records released the complete score of Back to the Future Part II in a 2-disc set including early scoring sessions and alternative takes. ^ a b c "Back to the Future Part II". AFI Catalog of Feature Films. Retrieved July 9, 2017. ^ "Back To The Future Part II (PG)". British Board of Film Classification. November 22, 1989. Retrieved June 21, 2015. ^ a b "Back to the Future II (1989)". Box Office Mojo. Retrieved December 31, 2016. ^ a b c d e Robert Zemeckis, Bob Gale (2005). "Back to the Future Feature: Making the Trilogy Part 2". Back to the Future Part II (DVD). Los Angeles: Universal Pictures. ^ a b Robert Zemeckis, Bob Gale (2005). Back to the Future Part II: Featurette (DVD). Los Angeles: Universal Pictures. ^ a b Schildhause, Chloe (November 25, 2014). "'Back To The Future II's Art Director Tells Us How They Developed The Film's Somewhat Misguided Predictions". Uproxx. Retrieved January 6, 2015. ^ a b Weinstein, Steve (February 4, 1989). "Back-to-Back Sequels for 'Back to Future'". Los Angeles Times. ^ Robert Zemeckis, Bob Gale (2005). "Back to the Future Feature: Making the Trilogy Part 3". Back to the Future Part III DVD. Los Angeles: Universal Pictures. ^ ""Back To The Future" Conspiracies, Alternate Endings, & Lawsuits with Crispin Glover". YouTube. June 6, 2013. Retrieved June 7, 2013. ^ "Back to the Future CED Web Page". Cedmagic.com. Retrieved August 20, 2011. ^ "Back to the Future – Comparison". YouTube. April 8, 2009. Retrieved August 20, 2011. ^ "Exclusive Behind the Scenes Part IV: How We Got Jennifer". gametrailers.com. March 23, 2011. Retrieved October 14, 2015. ^ "Thomas F. Wilson's "Biff's Question Song"". YouTube. September 27, 2006. Retrieved October 2, 2011. ^ Leopald, Todd (October 20, 2015). "What did 'Back to the Future II' get right?". CNN. Retrieved October 20, 2015. ^ a b Poppick, Susie (October 20, 2015). "10 Back to the Future Predictions That Came True". Time. Retrieved October 20, 2015. ^ Kelion, Leo (October 20, 2015). "Back to the Future II: What did it get right and wrong?". BBC. Retrieved October 20, 2015. ^ Frucci, Adam (June 26, 2008). "Nike Finally Releasing Back to the Future Part II McFly Sneakers, Sort Of". Gizmodo. Retrieved October 14, 2015. ^ "US2009042072 AUTOMATIC LACING SYSTEM". wipo.int. ^ O'Brien, Terrence (July 6, 2010). "'Back to the Future' Inspired Shoes Really Tie Themselves". Switched.com. Retrieved November 28, 2010. ^ O'Neal, Sean (September 8, 2011). "Nike finally making Back to the Future II's self-lacing shoes for real". The A.V. Club. Retrieved September 8, 2011. ^ Chan, Casey (September 8, 2011). "The Nike Air Mag—AKA the Back to the Future Shoes—Are Real, and They're Glorious". Gizmodo. Retrieved September 8, 2011. ^ Billington, James (February 17, 2014). "Nike is actually making Marty McFly's self-lacing shoes". New York Post. Retrieved February 17, 2014. ^ O'Kane, Sean (March 16, 2016). "Nike will sell actual self-lacing sneakers, just like Back to the Future". The Verge. Retrieved March 16, 2016. ^ Hanson, Kevin (April 18, 2013). "Why Don't We Have Hoverboards?". Popular Mechanics. Retrieved March 5, 2014. ^ "Canadian inventor tests new prototype of record-setting hoverboard". Canadian Broadcasting Corporation. October 14, 2015. Retrieved October 14, 2015. ^ Oremus, Will (November 16, 2012). "Let's Face It, We're Never Getting Our Hoverboards". Slate. Retrieved March 5, 2014. ^ Solon, Olivia (October 27, 2011). "Video: French researchers build hoverboard". Wired UK. Retrieved March 5, 2014. ^ Aamoth, Doug (March 5, 2014). "Funny Or Die: Fake HUVr Hoverboard Video Was Our Fake". Time. Retrieved March 5, 2014. ^ Sullivan, Paul (September 26, 2015). "Cubs' premature surge to playoffs defies all expectations, reasoning". Chicago Tribune. Retrieved September 27, 2015. ^ Oz, Mike (December 10, 2014). "Reminder: The Cubs won the 2015 World Series in 'Back to the Future 2'". Yahoo Sports. Retrieved August 5, 2015. ^ "'Future II' blitzes b.o. with $43-mil; Harlem shaggy, 'Talking' quieter". Variety. November 29, 1989. p. 6. ^ "SHORT TAKES : 'Back to Future' Falls Off; Still Leads Box Office Pack". Los Angeles Times. December 4, 1989. ^ "Back to the Future Part II". Rotten Tomatoes. Fandango Media. Retrieved September 22, 2018. ^ "Back to the Future Part II". Metacritic. Retrieved October 21, 2015. ^ Ebert, Roger (November 22, 1989). "Back to the Future: Part II". Chicago Sun-Times. Retrieved March 11, 2012. ^ Maslin, Janet (November 22, 1989). "Back to the Future II". The New York Times. Retrieved March 11, 2012. ^ Tunney, Tom (January 1, 2000). "Back To The Future: Part II Review". Empire. Retrieved June 24, 2016. ^ Rosenbaum, Jonathan (November 22, 1989). "Back to the Future Part II". Chicago Reader. Retrieved March 11, 2012. ^ "Back to the Future Part II". Variety. November 22, 1989. Retrieved March 11, 2012. ^ "Film: Achievement in Special Visual Effects in 1990". British Academy of Film and Television Arts. Retrieved October 23, 2015. ^ "The 62nd Academy Awards (1990) Nominees and Winners". Academy of Motion Picture Arts and Sciences. AMPAS. Retrieved April 9, 2014. ^ "Vid goes back to 'Future II' for May release of 'Future III'". Variety. March 21, 1990. p. 4. ^ "Description of DVD framing fiasco". Various. Archived from the original on February 11, 2007. Retrieved January 10, 2007. ^ Anderton, Ethan (September 16, 2015). "Bob Gale's Guide to 'Back to the Future' Celebration Events Coming in October". Slash Film. Retrieved October 14, 2015. Wikimedia Commons has media related to Back to the Future Part II. Wikivoyage has a travel guide for Back to the Future Part II. This page was last edited on 17 April 2019, at 01:06 (UTC).